Anglers (hook & line) and ODFW electrofishing crews fish for wild trout. When a trout is captured, species, fork length, and river location is recorded. Captured trout are tagged using uniquely numbered Floy® tags, held until recovered and released near the point of capture. For trout subsequently recaptured, the same information is recorded, with the fish released with the initial tag. This mark and recapture method can be used to estimate the size of a unknown population. We sampled over 3,100 fish during the course of the four-year study, including 1,949 wild trout, of which 1,724 were marked with individually-numbered Floy tags. The majority of sampling effort was conducted by trained volunteers, angling with hook and line (2558.5 hours). ODFW crews supplemented sampling effort with boat electrofishing and seining (30.8 hours). This table shows details of the marks and recaptures in each year of the study. We computed population estimates for each wild trout species, as well as a composite estimate of the wild trout population. using the Chapman Modified Schnabel Equation as detailed at the bottom of this page. Numbers in parenthesis indicate recaptures from previous years. So that's neat and all. How'd the volunteer anglers do? Did fishing improve? Click quickly and find out, before there’s any more talk about equations and statistics! Mark & Recapture (also known as Capture / Mark / Recapture) is a common method of estimating the size of an unknown population. A portion of the population is captured, marked, and released. Later, another portion is captured, and the number of marked individuals within the sample is counted. Since the number of marked individuals within the second sample should be representative of and proportional to the number of marked individuals in the whole population, an estimate of the total population size can be obtained. The number of marked individuals in the first sample is divided by the proportion of marked individuals in the second sample. This can be expanded longitudinally, as in this study, where individuals are marked and recaptured over the course of multiple sampling intervals. 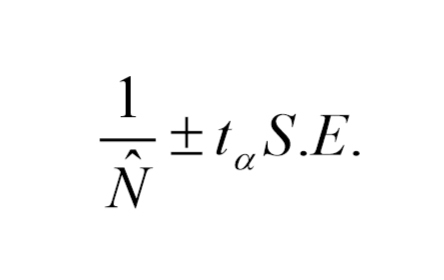 The Schnabel Equation, first published in 1938, is used to estimate the size of fish populations in multiple-census mark and recapture studies. It is based on a weighted average of multiple sampling dates. The Chapman modification produces more accurate estimates in cases where the each sample catch and total marked population are believed to be less than 10% of the total population size. 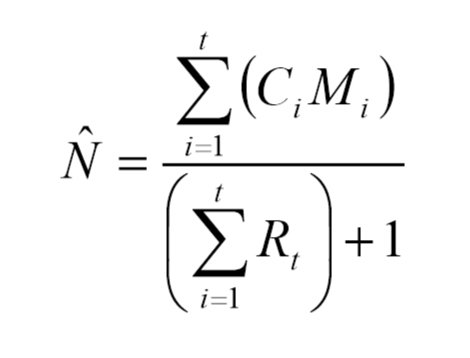 The Chapman modified equation tends to produce estimates slightly lower than that originally proposed by Schnabel. 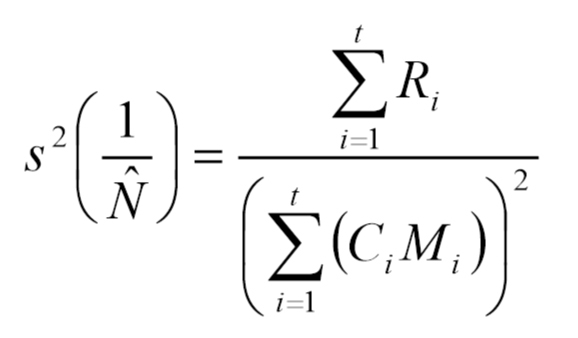 The Chapman Modified Schnabel equation, as well as variance, standard deviation, and confidence interval equations, are provided below for reference. The Chapman modification is used if the each sample catch and the marked population are less that 10 % of the population size. Please see here for a more comprehensive description of the variables used in this analysis. Our confidence intervals were computed at the 95% level, based on a normal distribution, as proposed by Chapman. Some biometricians advocate calculating confidence intervals based on a Poisson distribution where the total number of recaptures is under 50. This would likely produce tighter confidence intervals for our data set. We DID warn you about the wall of math. Luckily, the next section is much easier to follow.